ISSR is pleased to announce its new partnership with St Mary-le-Bow church in organising and hosting the prestigious Boyle Lectures on Science and Religion. The first lecture to be held as part of this partnership will be delivered Monday 18th February 2019. This lecture will be delivered by ISSR’s President, Professor Michael J. Reiss, and we are delighted to have Professor Janet Soskice as the respondent. of science education and theology. The original Boyle Lectures were given as a series of sermons at a number of churches in London and Westminster following their establishment in 1692. The ‘original Boyles’ lasted until about 1730, although sporadic later ‘Boyle Lectures’ continued to be given in the centuries since then. 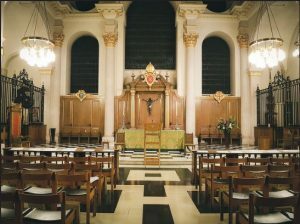 The lecture series was revived in 2004 at one of its original locations, the Wren church of St Mary-le-Bow on Cheapside in the City of London.